Scratchcards – The Perfect Promotion? Scratchcards or Scratch Cards? Whether it’s one or two words doesn’t really matter. We think they’re one of the best promotional vehicles in existence. We’ve been producing personalised scratchcards for many years now – have to hold up a hand and confess to producing thousands and thousands of the little beauties for a timeshare operation in Central London (but it was in the late 80′s so please excuse us) – and in that time we’ve produced all sorts of games. Interactivity: for a start people just love them; give someone a scratchcard and they’ll have the latex off before you can blink, especially with the added frisson of winning something for nothing. Adaptability: with nothing coming “off the shelf” the game, the design and everything else can be tuned to provide a completely personalised promotion to support any marketing activity you like and enhance brand values. Historically small print runs of just a couple of thousand cards have looked disproportionally expensive. There are three separate processes involved, each with its own minimum charge, so economies of scale didn’t kick in until you produced 5000 or so cards. The introduction of more modern machinery and techniques has seen the production costs fall so that the minimum cost is now getting on for half what it was ten years ago. 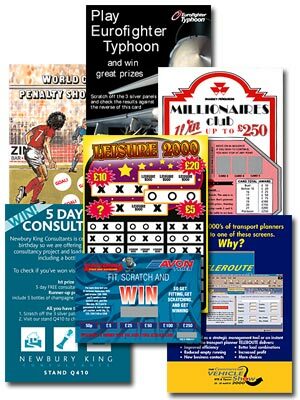 Nowadays you can have your own personalised scratchcard promotion, with a game tailored to your exact needs for well under £1000. This entry was posted in Miscellany and tagged promotional scratchcards, scratch by Pete. Bookmark the permalink. Many thanks I look forward to hearing from you. Are these custom designed scratchcards?